The Director of the Land Trust for the Coastal Plain, Judy Steckler, appears to have a problem telling the truth about the Land Trust’s involvement as a financial intermediary in the DMR purchase of Former DMR Executive Director Bill Walker’s son Scott’s piece of land on Bayou Porteaux. Once known as a nonprofit with a sterling reputation the Land Trust has taking a major and well deserved beating for their role in what strongly appears to be a sophisticated, criminal enterprise. After yesterday’s story I do not see how the Land Trust can keep Ms. Steckler as its executive director but as we saw with the CMR it is possible the Board of Trustees of the Land Trust remains firmly in denial, in the process breaching their fiduciary duty to the organization. Finally Nelson tells us in detail the FBI’s role in the investigation and one of the leads they are chasing using the same investigative technique the FBI used in the neighborhood canvas. It appears Bill Walker’s son Scott may need fabled beltway criminal defense attorney Bernie Grimm’s services again as the FBI has taken an interest in the DMR’s purchase of Walker’s lot. It is not much of a stretch to extrapolate that CIAP director Tina Shumate and her purchase of her parent’s property is also under the same scrutiny. How Shumate remains at DMR drawing a paycheck defies the imagination. Next up Michael Newsom takes a stab at the DMR purchase of the old Winn Dixie property in the Pass. A couple of things stuck out at me the first being that the story photo appears to be the property across the street from the parcel purchased by DMR. 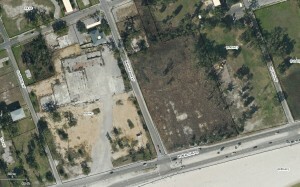 Following is an aerial photo of the location with the slab and parking lot of the old Winn Dixie still visible. We’ve been here and done this property on Slabbed way back on November 5 of last year. The Sun Herald protected the identity of the beneficiary of this DMR friends and family program purchase, Jackson based developer Gary Cress in their story. I well remember when the Pass Winn Dixie closed a month or so before Katrina. Cress was planning to develop the parcel into condos. The parcel across Henderson Avenue sold the summer before Hurricane Katrina for $800,000 with an eye toward the same purpose. The $800,000 parcel on the right, over 3 acres of land, is lower in elevation than the Cress parcel and had never been developed since Hurricane Camille for that reason. 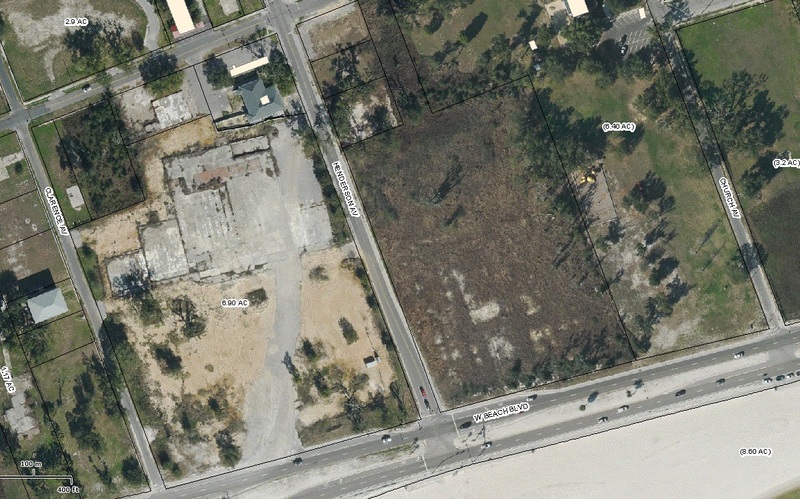 It would seem to fit the DMR criteria for land purchases better than the old Winn Dixie site. It should also be lost on no one that land values on the Mississippi Coast reached their zenith that summer before Katrina as condomania swept the land. Today the parcel on the right is for sale by owner and I’m guessing the reason it has not sold, despite being on the market close to 7 years, is due to overvaluation associated with the original purchase in the summer of 2005. Source: US Department of Interior, Office of Inspector General preliminary report graphic on appraisal standards violated by DMR and its appraisers. There are only a few properties with more flaws in the DMR appraisals than “Pass Christian Beach Front”. One of the standards that was violated included “improper extraordinary assumptions”. I’d bet the one of those extraordinary assumptions involved using the land for a casino, which would be a bogus assumption if my speculation is accurate given the Pass does not allow gaming on its waterfront. One naturally wonders what 7 acres of land on the coast is worth for use as a dog park. I guarantee you it is way less than the $430,000/acre paid by DMR for Cress’ property. Finally we need to discern if we are seeing a trend that would clue us in to the larger scheme perpetrated by Bill Walker and Tina Shumate and for that we need to revist the Harbor Landing purchase from David Harris. You see folks, for years after the storm there was no traffic signal at the intersection of US Highway 90 and Henderson Avenue in the Pass as one was not needed. The Winn Dixie that was there was closed and the empty building was washed away by Katrina. Within the past 2 years however, MDOT replaced the traffic signal despite the fact the intersection was still undeveloped. Whether a large flood plain tract owned by the Ward family of River Birch infamy in Gulfport or a failed restaurant in Harbor Landing the mayors of the cities impacted by State of Mississippi purchases inevitably want the land returned to the tax rolls for a commercial use. The impact of this is what I’ll term the “recycling aspect” of the DMR friends and family program. Harbor Landing was purchased at an inflated value that bore no relation to its true market value and taken out of commission for a while. After the previous owner, David Harris finally vacated the property, Walker and the DMR was on the verge of putting the property back into commercial use via a land swap that did not “appear even” based on what DMR paid for Harbor Landing thus potentially benefiting the proposed new owner of the Harbor Landing property. A swap would be one way to hide the disparity between the inflated prices DMR was paying for land and the deflated values apparently sought by DMR on the back end. A benefit to this scheme is Walker would have the various coastal mayors as DMR’s de facto lobbyists pushing those deals as we saw in Ocean Springs with Mayor Moran and the proposed Harbor Landing land swap. Pass Christian Mayor Chipper’s McDermott reinforces this point in remarks quoted in Michael’s article that I linked above. There is a genius involved in Walker’s CIAP scheme that can’t be understated. Had it not been for the phony baloney appraisals, it may well have worked had it not been for the unbridled greed involved. Next up we’ll take another look at the Sun Herald’s public record’s, lawsuit as the criminal investigation exemption to the public records statute has now come up in Jefferson Parish. Stay tuned. This is one of the properties where the owner bought his appraisel on Craigs List or somewhere you could pick your own value and it was accepted as legitimate at Barber and Mann because they did not review it.In todays REALestate world a seller or lender is not even allowed to contact an appraiser to keep this type of schemes from happening.During a time when values had fallen across the Coast from 30% to 40% you see them on a Saturn rocket at DMR.Who on the inside worked with these owners to push these deals to closing?The only way this can happen is for the participants to conspire to do so.Is this Jackson developer someone that was represented by Maxwell/Walker? Somebody opened the door at DMR.This is not a site that anyone goes looking for to put into conservation.And now a DOG PARK? No green heron here. where the property sold fo $325,000 on June 8, 2012, and 8 weeks later was sold to the school board for $580,00 with no improvements at all made to it. That’s a quarter of a million profit for the seller (LNG). Suffice it to say this may have been a good deal for someone, but it wasn’t the Bay-Waveland taxpayers, they took the beating here because now they have all of the improvements to make, which at present are at about 1.5 million and counting! Keep us posted. 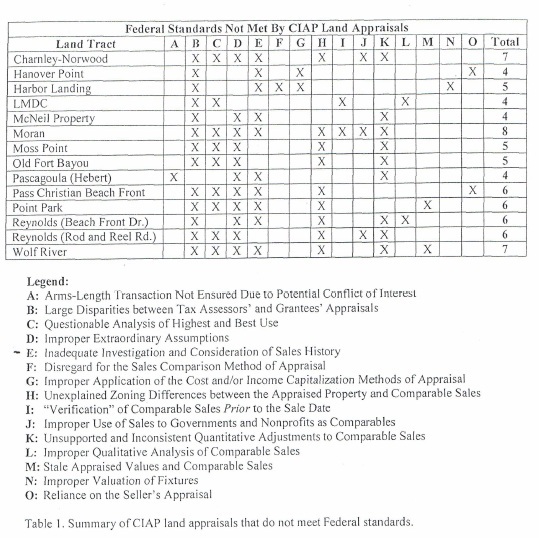 Those federal appraisal standards are all rooted in sound professional appraisal practices. Of all the flaws an appraisal can have, inconsideration of such a recent sale is fatal. You would think that someone that actively encourages others to place the term “Doctor” in front of their names like Asper and Sherry Ponder would understand that better than most. Sad thing is for the people in Bay St Louis is the light bulb never came on for Sherry Ponder. Her conduct. along with that of the Bay Waveland School board, is best described as disgraceful when it comes to the Bay Tech building purchase. They still have more non-X than X boxes. Granted in a few cases they come pretty close. If they were truely great crooks wouldn’t they maximize their profit by checking all the boxes? Laziness, pure laziness. Based on what has come to light so far, is it within the realm of possibility that the DMR could/would fudge wetland determinations to discourage development as a favor to those within the right circle, or fudge wetland determinations in a way that frees development for friends and family? Has a ‘wetlands checklist’ chart similar to the above bobbed to the surface? Wetlands determinations are made by licensed wetlands engineers and signed off on by the US Army Corp in Mobile. You are so right about the Harbor Landing purchase. The most egregious thing about Harbor Landing is that it was a scam from the get-go. It was built for Harris by a company owned by a sitting alderman at the time, Anchor Construction, owned by Alderman Danny Jalanavich. It was illegal as to the use (which issue the people around it took to court and won), and it was built with an unsigned building permit. Later, Tom Reynolds put money into the place, and apparently also took on Harris as a partner in the lot he and his company owned that was also purchased by DMR with CIAP money on Front Beach in OS. This is also the group that includes Palazzo’s daddy. Guess what folks; the mayor of Ocean Springs is still trying to grab Harbor Landing, now for “tour boats” if the slimy aldermen can be led into it, and meanwhile Reynolds and Harris roll in the money they got for their vastly overvalued land and in Harris’ case, illegal bars and businesses. Everyone got ripped off yet again, and Harris and all the CIAP land owners, all friends of Billy or Baby or Haley, are keeping the money! Ask the OS mayor why DMR bought Charnley House in OS with CIAP money, spent over $100,000 to fix it up (which is ongoing, even though DMR is broke) and then winds up giving it to the City of OS for a party palace? What a waste! Trust me, Russell, more X’s should have been checked in those boxes as to the insider deals of the “friends of Billy and David”. The Harbor Landing deal is one of my favorite land scams. This is about as “In yor face” as it gets.The article in the Ms.Press right after the sale closed with David Harris talking about how much he got with a big smile on his face and then bragging around town about the fact that not only did he get big money he also got to keep all of the revenue from boat storage rentals for 18 months after the sale/closing.Billy Walker when asked what DMR paid for Harbor Landing said “It would not be appropriate to talk about the purchase price”.In other words what they were both saying to the taxpayers is “Screw off”.The income stream from the Harbor Landing operation would only support a valuation of $1,300,000.Other potential buyers looked at it but could not pay more than it was worth.Harris was trying to sell this property for more than 2 years then DMR came along with the purchase price we all now know was 3 times more than the market value of the property.SmokingDolphin is correct that Reynolds and Palazzo owned the lot at 323 Front Beach Blvd.that sold to DMR for almost a cool million.This property is very low an in a V zone which means it has no value from a development standpoint.If you go to the Ms.Sec. of State website you will find an LLC that includes Harris,Reynolds and Palazzo.I was not aware that they were involved in Harbor Landing together but it makes sense.Another Harris land scam to look into in Ocean Springs involving Harris and Jalanavich is on the corner of Hyway 90 and Hanshaw Rd. across from Walmart.This property was donated to the Y and then transfered to Jalanavich prior to being sold to the current owner.Then I guess we all could demand a relook at Cedar Point but I think there is enough on the table to place this group in a Federal Retirement Home at Eglin or somewhere for a long time.And the taxpayers will have to pay for that also. Wetland delineation is no rocket science and there are companies that do it regularly. The rules have always been argued by various groups but the standards are through the US Army Corps of Engineers http://www.mvn.usace.army.mil/ops/regulatory/reg_wetland_how.asp and the Natural Resource Conservation Service http://www.nrcs.usda.gov/wps/portal/nrcs/detailfull/national/water/wetlands/?cid=nrcs143_010939. Once property is acquired for conservation purposes it should be enhanced or restored, like, pull up the old slab and plant native plants. I think the question is if you use the right consultant and pay as an example $250,000. into a private foundation can you get your permit signed off on the same day the check is delivered. If you have ever gone thru the wetland permit process you would know it takes a long time and the journey begins at DMR were the first thing they do is make sure yoou comply with the “Coastal Zone” regulations before they distribute the application to the other agencies.It can be done in a day or if they decide can sit around on someones desk for months or can even be denied. If the right person pushes it like in the case of the Imperial Palace permit it can be signed the day the $250,000. check arrived.How many others were processed in the same way as the IP? I think it is worthy of a look by the G-men. This entire DMR scandal is like trying to unwind a large backlash of fishing line on an old reel…one has to keep pulling and unwinding and the longer it goes the more knots we find. It may be two or more years before all the knots are unwound; all the guilty are revealed. More time for the guilty to sweat it out! Going back to Cedar Point where the tax payers of Jackson County were duped out of $4.9 million for a parcel of land worth less than $900,000, the same names that created that fraud are also the same names listed as property owners and beneficiaries of the CIAP money. Can you grasp the arrogance of Harris not willing to turn loose of the boat rental monies for 18 months after the sale? Reynolds and Palazzo also were knee-deep in Cedar Point just like Harris and here they are again at the public trough. slopping up like pigs. They must have thought they were untouchable. Harris is famous for saying:” Yeah, well they can indict a ham sandwich if they want to.” Its pork all right and legions of taxpayers are hoping their trough is suddenly empty and the fraud is uncovered, if the FBI can unwind the long line of deceit and untangle the knots. But wait folks, more potential frauds are still out there…the Street knows more than has yet come to light. in high places. I even checked their website–nothing! Thank God for internet news like Slabbed. I would have to say that the latter part of your first sentence is true???? It takes a lot of players to keep a conspiracy like this in operation for the amount of time it has been going on. I hope that they get all of the players involved….from the little dogs, on up through the high ranks….and Walker isn’t the biggest fish involved in this party either!!! Did you read this one? http://www.sunherald.com/2013/01/23/4424293/politicians-giving-marine-resources.html#wgt=rcntnews There are some big fish right there. This is akin to rats jumping off a sinking ship. Speaking of criminal defense atty Bernie Grimm: who paid for the legal fees for Walker’s son’s battery case? Also who paid off the judge in that local DUI trial? How did he get away with both as if they never happened? I saw on another forum that Bernie Grimm cost the Walkers over $200K. Does anyone know or how can we find out? I bet those bills were paid by DMR (us, the taxpayers)! Just another leg of this muti-tenacle fraud monster.I give you a donation you give Jr. something then he shares with me or I give you a permit you make a donation to the candidate of my choice then I will let him know its source.So many ways, so many people.We will never know all that played a part but we do know who the key players are in this multi-level scheme.They are many at DMR involved,there are many private companies that played to get approvals and we know who some are and now we know some politicians benifited by keeping Walker in place at the DMR.Wow it is far from over and will go on for years in my opinion. Why aren’t they searching Bill, Sharon, and Scott Walker’s homes? Note to Walkers, David Harris, et. al. :Take all your files, records, stubs and bank statements(I said all bank statements, including off-shore accounts)and leave them at your psychiatrist’s office so they will be considered privilege information not subject to a search. Oh, you say you don’t have a psychiatrist? Maybe you should seek one out and maybe double up with all your favorite fraudulent-loving friends and you could get a group rate. Sorry…I can’t help myself!! morning on the search of Shumate’s home. sit and read a book. Sorry, I forgot to ment “Pet of the Week.” Are these people just not tuned in or what? Tar and Feather as someone else mention is most appropriate. Does anyone remember which lawyer or law firm represented the Pass Christian School Board back during the transition between the reigns of Glen East and Philip Terrell? I think this may eventually relate to the GOB’s in DeLisle/Pass Christian who ran the show back then, and are partially responsible for what’s about to go down in Hancock County. Weren’t the Simpsons from DeLisle in the long ago days? I’d really like someone to explore these same concepts in District 5 in Jackson County. Not much down there, I know, but certainly enough nefarious activity concerning the tax rolls to get my attention.